There have been some crazy merchandising efforts to capitalize on the Star Wars franchise, but I think this one cuts to the heart of silly. Star Wars has had some great merchandise. Pajamas for kids (and adults), figurines, Legos .. you name it, it has probably somehow, some way, had a Star Wars label attached to it. But this new thing is either incredibly creative, or just another marketing ploy to get kitchen geeks to drop $120 for their product. Coming in late August, available from The Fowndry, you can use the Force to protect your kitchen with a ... wait for it ... an X-Wing Knife Block. 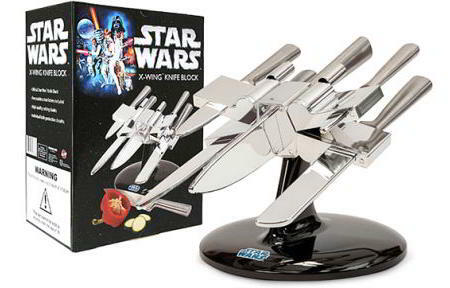 The five stainless steel kitchen knives are arranged creatively in the shape of a diving X-Wing fighter. But sadly, the "block" is only a "chrome-effect plastic knife holder". But if this intrigues you, then you can pre-order it now. You'll get a cook's knife, a bread knife, a carving knife, a utility knife, and a paring knife. The whole thing seems a bit cheesy for $120. And frankly, I'd prefer a lightsaber cheese cutter instead.